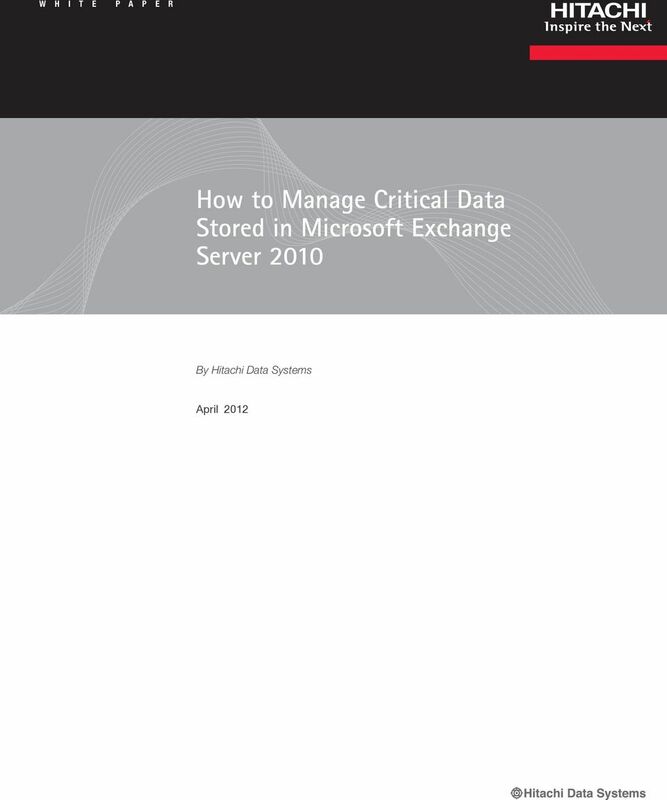 Download "How to Manage Critical Data Stored in Microsoft Exchange Server 2010. 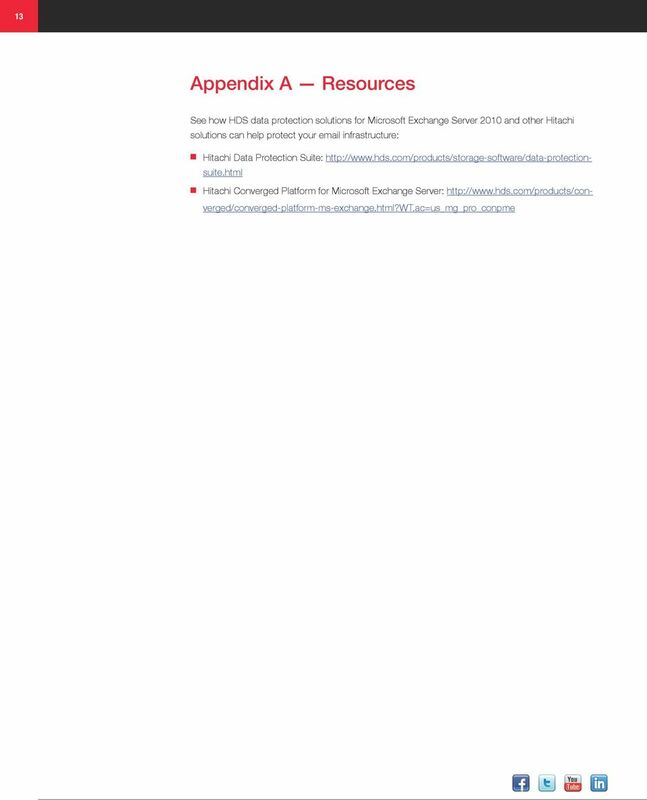 By Hitachi Data Systems"
3 3 Executive Summary and Introduction As organizations of all sizes rely on more than ever before to conduct daily business operations, Microsoft Exchange Server has become a mission-critical system. 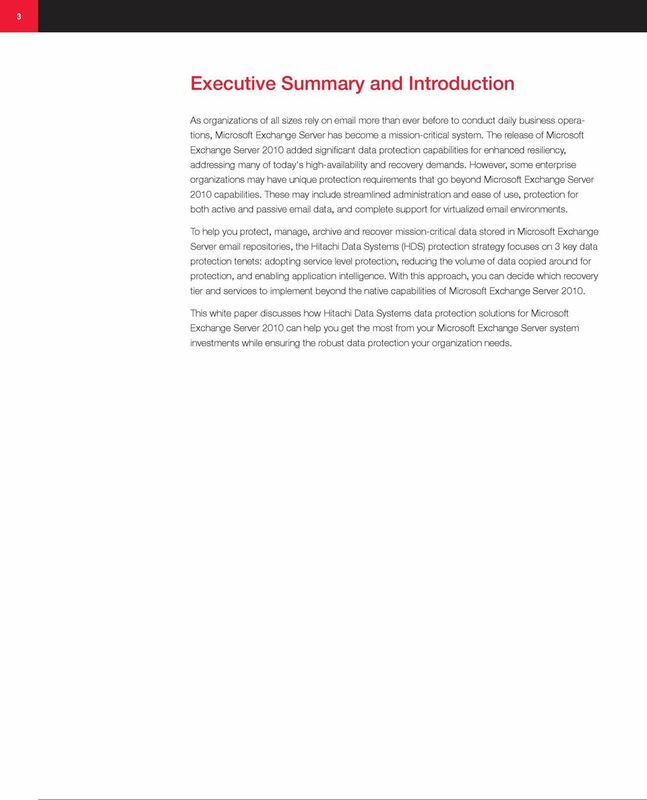 The release of Microsoft Exchange Server 2010 added significant data protection capabilities for enhanced resiliency, addressing many of today's high-availability and recovery demands. 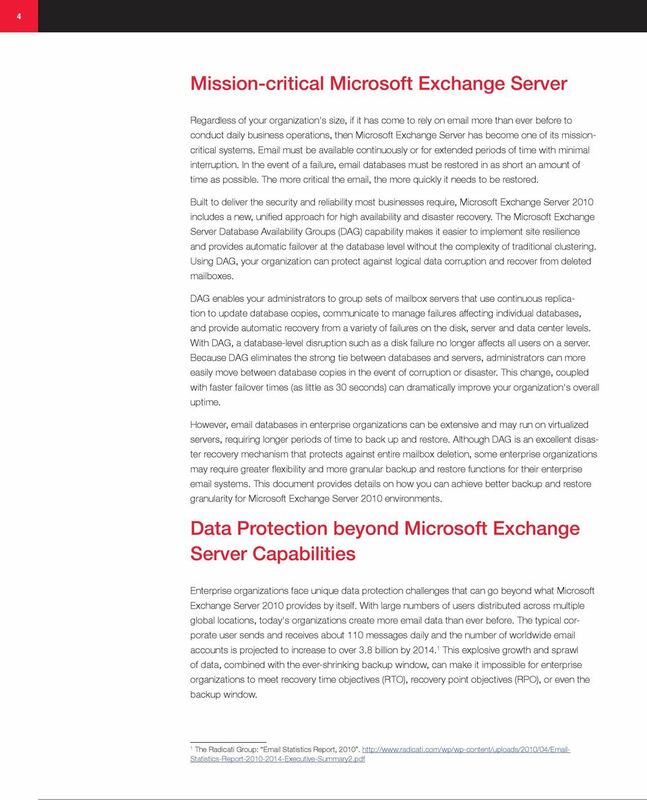 However, some enterprise organizations may have unique protection requirements that go beyond Microsoft Exchange Server 2010 capabilities. These may include streamlined administration and ease of use, protection for both active and passive data, and complete support for virtualized environments. 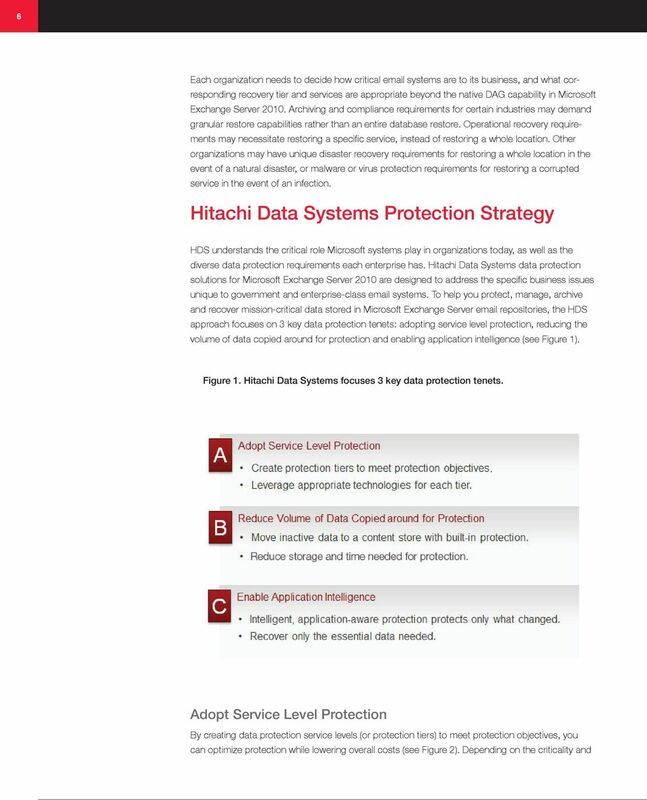 To help you protect, manage, archive and recover mission-critical data stored in Microsoft Exchange Server repositories, the Hitachi Data Systems (HDS) protection strategy focuses on 3 key data protection tenets: adopting service level protection, reducing the volume of data copied around for protection, and enabling application intelligence. 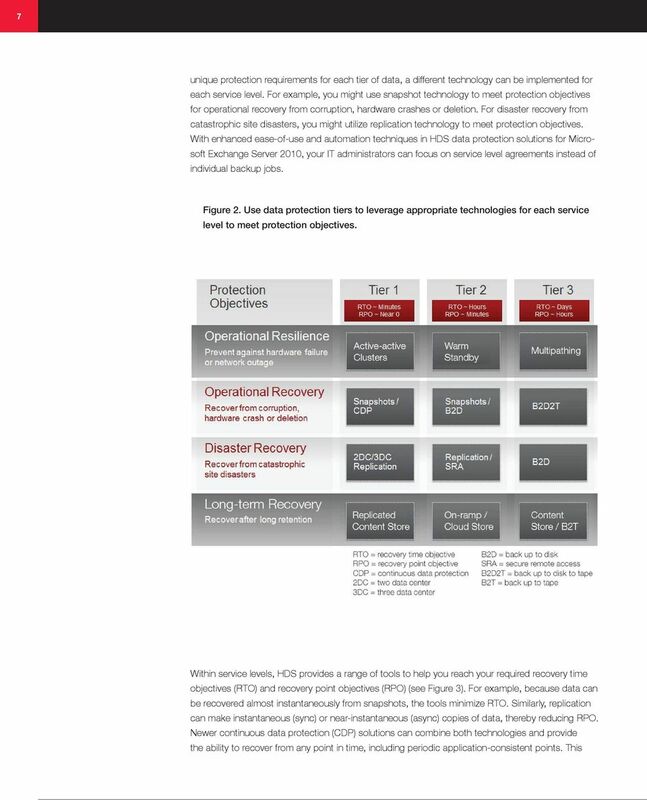 With this approach, you can decide which recovery tier and services to implement beyond the native capabilities of Microsoft Exchange Server This white paper discusses how Hitachi Data Systems data protection solutions for Microsoft Exchange Server 2010 can help you get the most from your Microsoft Exchange Server system investments while ensuring the robust data protection your organization needs. 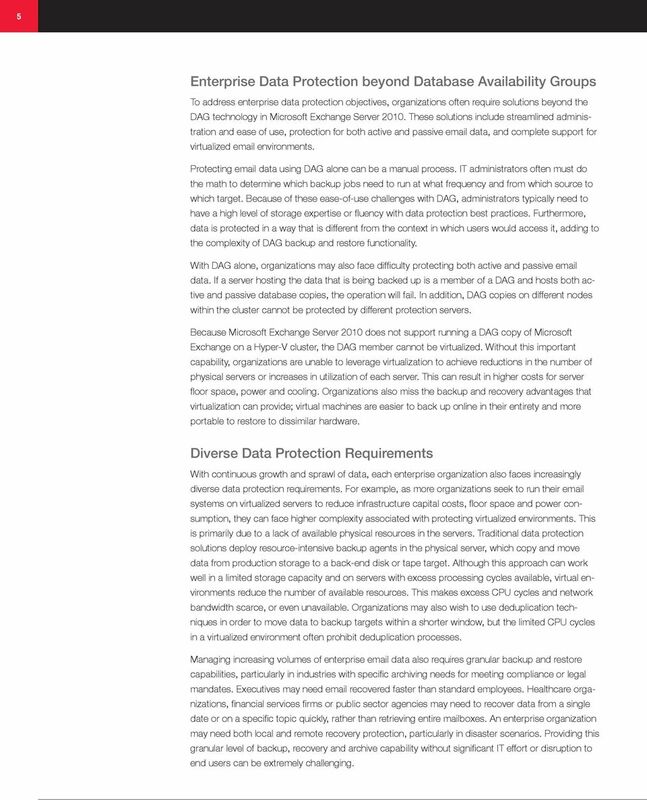 5 5 Enterprise Data Protection beyond Database Availability Groups To address enterprise data protection objectives, organizations often require solutions beyond the DAG technology in Microsoft Exchange Server These solutions include streamlined administration and ease of use, protection for both active and passive data, and complete support for virtualized environments. Protecting data using DAG alone can be a manual process. IT administrators often must do the math to determine which backup jobs need to run at what frequency and from which source to which target. Because of these ease-of-use challenges with DAG, administrators typically need to have a high level of storage expertise or fluency with data protection best practices. Furthermore, data is protected in a way that is different from the context in which users would access it, adding to the complexity of DAG backup and restore functionality. With DAG alone, organizations may also face difficulty protecting both active and passive data. If a server hosting the data that is being backed up is a member of a DAG and hosts both active and passive database copies, the operation will fail. In addition, DAG copies on different nodes within the cluster cannot be protected by different protection servers. 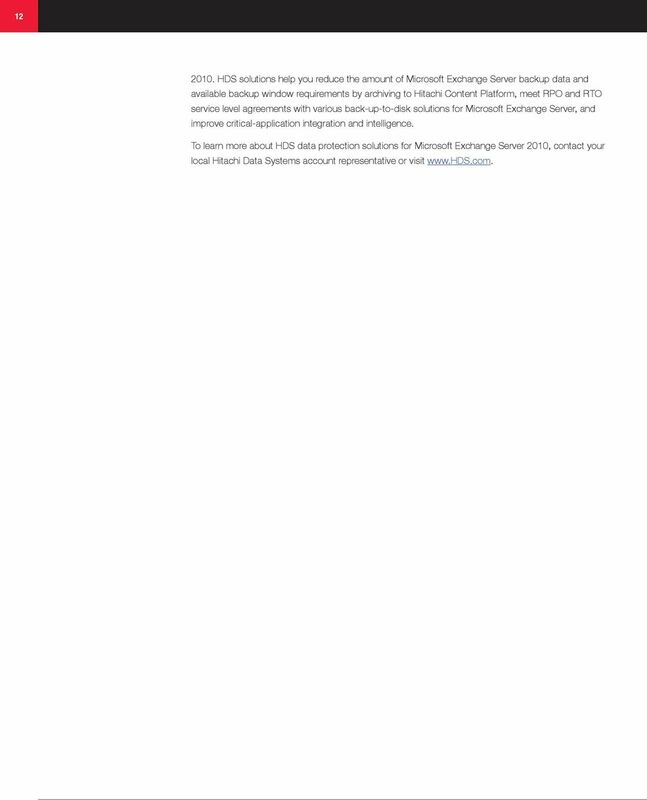 Because Microsoft Exchange Server 2010 does not support running a DAG copy of Microsoft Exchange on a Hyper-V cluster, the DAG member cannot be virtualized. Without this important capability, organizations are unable to leverage virtualization to achieve reductions in the number of physical servers or increases in utilization of each server. This can result in higher costs for server floor space, power and cooling. Organizations also miss the backup and recovery advantages that virtualization can provide; virtual machines are easier to back up online in their entirety and more portable to restore to dissimilar hardware. Diverse Data Protection Requirements With continuous growth and sprawl of data, each enterprise organization also faces increasingly diverse data protection requirements. For example, as more organizations seek to run their systems on virtualized servers to reduce infrastructure capital costs, floor space and power consumption, they can face higher complexity associated with protecting virtualized environments. This is primarily due to a lack of available physical resources in the servers. Traditional data protection solutions deploy resource-intensive backup agents in the physical server, which copy and move data from production storage to a back-end disk or tape target. Although this approach can work well in a limited storage capacity and on servers with excess processing cycles available, virtual environments reduce the number of available resources. This makes excess CPU cycles and network bandwidth scarce, or even unavailable. 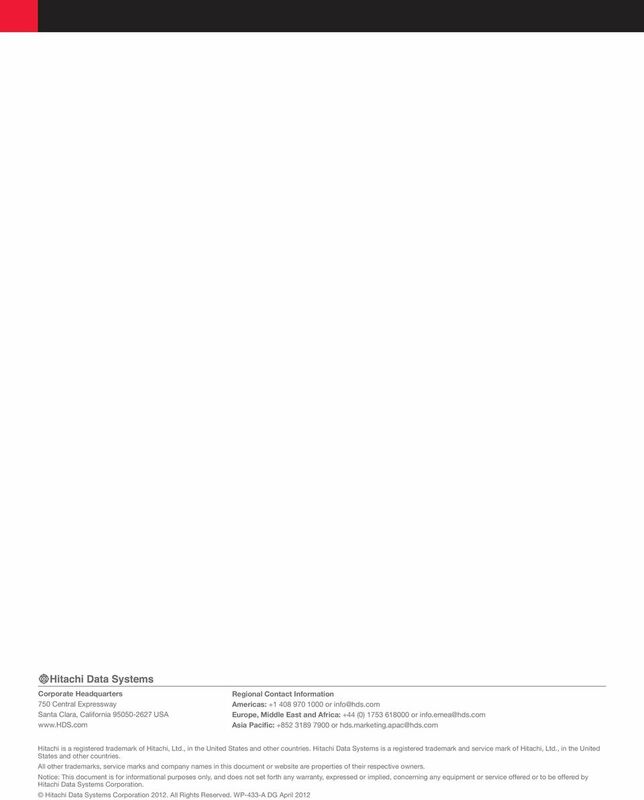 Organizations may also wish to use deduplication techniques in order to move data to backup targets within a shorter window, but the limited CPU cycles in a virtualized environment often prohibit deduplication processes. Managing increasing volumes of enterprise data also requires granular backup and restore capabilities, particularly in industries with specific archiving needs for meeting compliance or legal mandates. Executives may need recovered faster than standard employees. Healthcare organizations, financial services firms or public sector agencies may need to recover data from a single date or on a specific topic quickly, rather than retrieving entire mailboxes. An enterprise organization may need both local and remote recovery protection, particularly in disaster scenarios. Providing this granular level of backup, recovery and archive capability without significant IT effort or disruption to end users can be extremely challenging. 8 8 is especially valuable for high transaction rate financial institutions and other critical areas. These point-in-time copies can be created as frequently as every 15 minutes and mounted as standalone Microsoft Exchange Server databases for greater recovery flexibility. Figure 3. Using disk as the backup target (B2D) in a tape emulation mode (virtual tape library or VTL) is least disruptive, while snapshots and replication can minimize RPO and lower RTO. Reduce the Volume of Data Copied around for Protection Moving inactive data to a content storage platform can reduce the amount of data that needs to be protected (see Figure 4). With less data, less time is required for protection and recovery. This minimizes the protection or backup window required and the protection or backup infrastructure needed. By choosing a content platform that has built-in data protection, the archive target becomes more secure. With HDS data protection solutions for Microsoft Exchange Server 2010, you gain the flexibility to protect both active and passive data. For example, Hitachi Data Protection Suite (HDPS) is aware of both active and passive copies and will perform a successful backup of both copies. Multiple DAG copies on different nodes within the cluster can be protected by different HDPS servers. More importantly, this protection approach also allows simplified protection of large Microsoft Exchange Server configurations by multiple HDPS servers. 9 9 Figure 4. Moving inactive data to a content storage platform minimizes the amount of data requiring protection, reducing the protection or backup window. 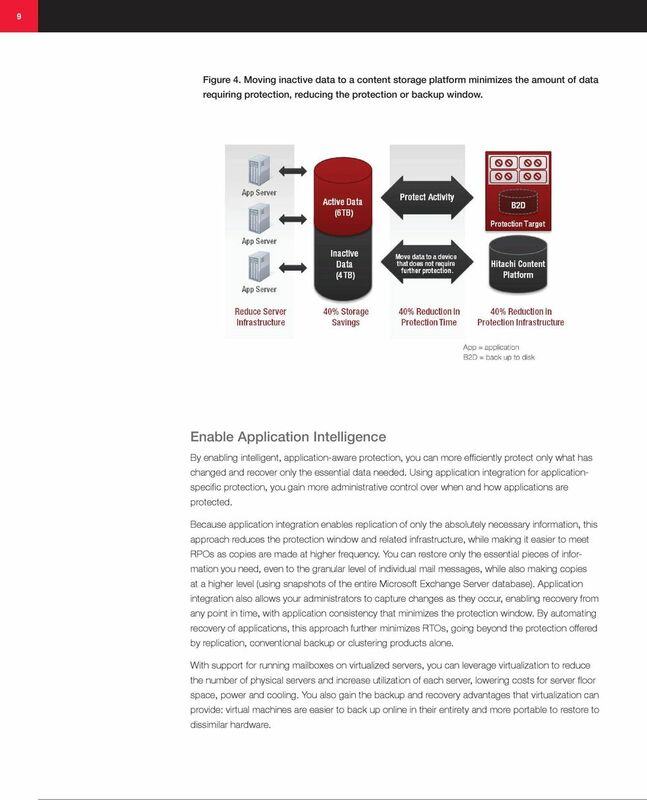 Enable Application Intelligence By enabling intelligent, application-aware protection, you can more efficiently protect only what has changed and recover only the essential data needed. Using application integration for applicationspecific protection, you gain more administrative control over when and how applications are protected. Because application integration enables replication of only the absolutely necessary information, this approach reduces the protection window and related infrastructure, while making it easier to meet RPOs as copies are made at higher frequency. You can restore only the essential pieces of information you need, even to the granular level of individual mail messages, while also making copies at a higher level (using snapshots of the entire Microsoft Exchange Server database). Application integration also allows your administrators to capture changes as they occur, enabling recovery from any point in time, with application consistency that minimizes the protection window. By automating recovery of applications, this approach further minimizes RTOs, going beyond the protection offered by replication, conventional backup or clustering products alone. With support for running mailboxes on virtualized servers, you can leverage virtualization to reduce the number of physical servers and increase utilization of each server, lowering costs for server floor space, power and cooling. You also gain the backup and recovery advantages that virtualization can provide: virtual machines are easier to back up online in their entirety and more portable to restore to dissimilar hardware. 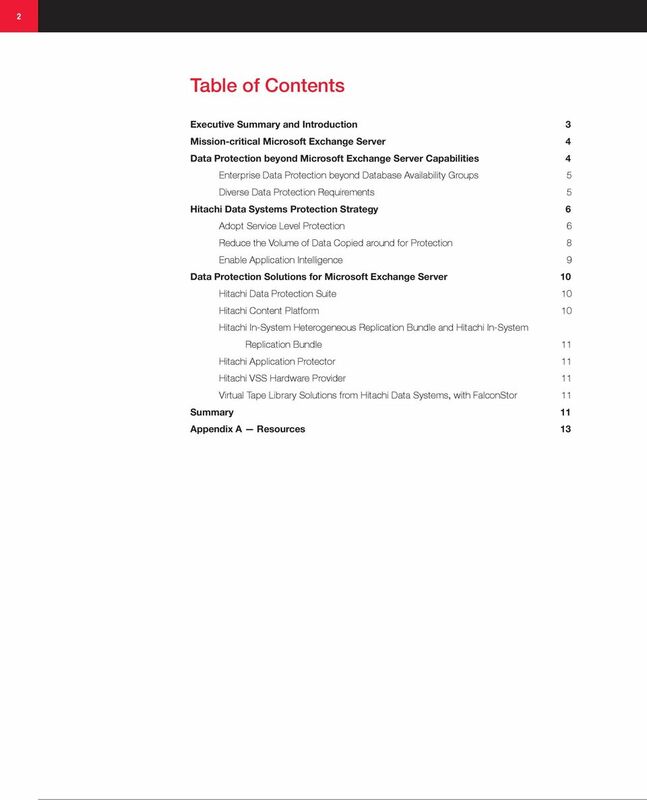 10 10 Data Protection Solutions for Microsoft Exchange Server The HDS approach incorporates a consistent data protection strategy across a portfolio of data protection solutions for Microsoft Exchange Server. The range of solutions includes archiving, backup and restore, and replication capabilities to help you protect, manage, archive and recover mission-critical data stored in Microsoft Exchange Server repositories. HDS data protection solutions for Microsoft Exchange Server 2010 not only support full DAG implementation for typical deployments, but also go beyond Microsoft Exchange Server to address the unique requirements of enterprise organizations. 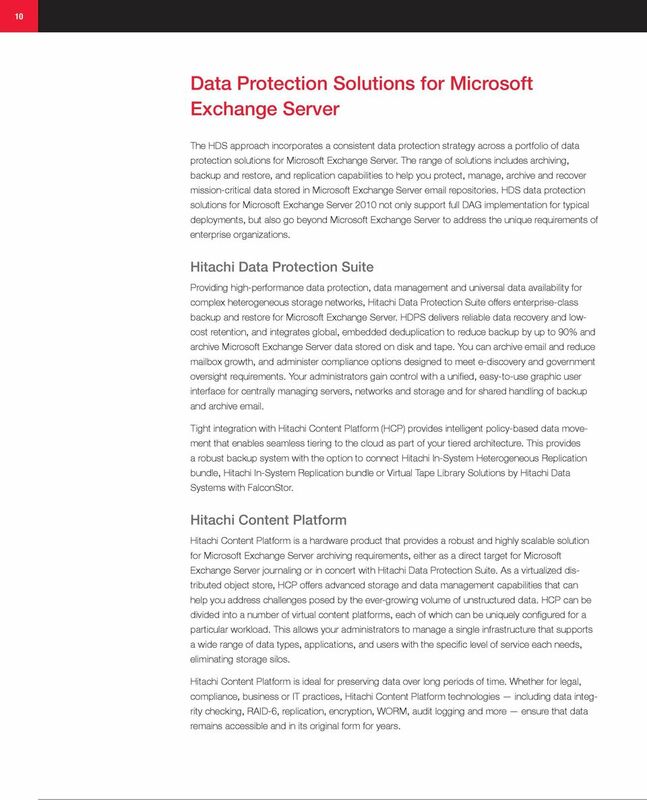 Hitachi Data Protection Suite Providing high-performance data protection, data management and universal data availability for complex heterogeneous storage networks, Hitachi Data Protection Suite offers enterprise-class backup and restore for Microsoft Exchange Server. HDPS delivers reliable data recovery and lowcost retention, and integrates global, embedded deduplication to reduce backup by up to 90% and archive Microsoft Exchange Server data stored on disk and tape. You can archive and reduce mailbox growth, and administer compliance options designed to meet e-discovery and government oversight requirements. Your administrators gain control with a unified, easy-to-use graphic user interface for centrally managing servers, networks and storage and for shared handling of backup and archive . Tight integration with Hitachi Content Platform (HCP) provides intelligent policy-based data movement that enables seamless tiering to the cloud as part of your tiered architecture. 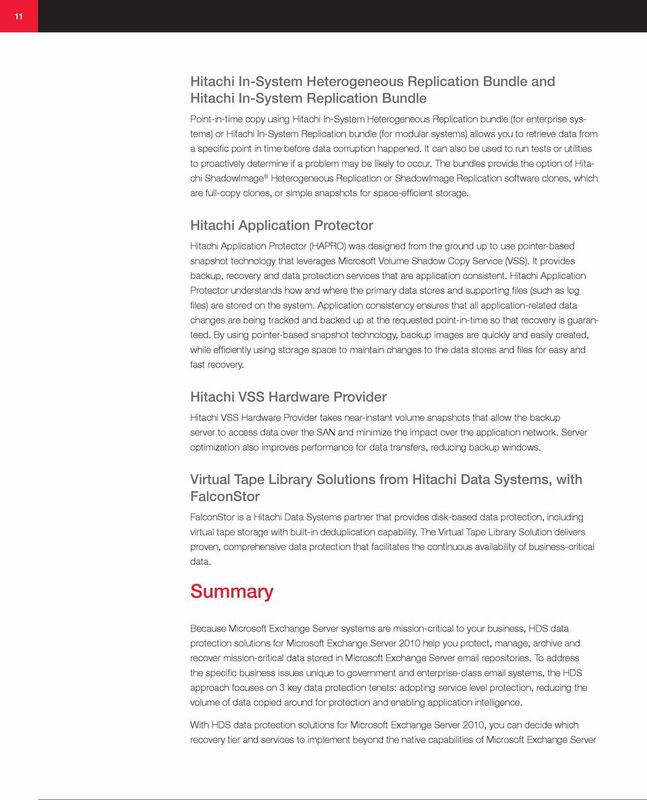 This provides a robust backup system with the option to connect Hitachi In-System Heterogeneous Replication bundle, Hitachi In-System Replication bundle or Virtual Tape Library Solutions by Hitachi Data Systems with FalconStor. Hitachi Content Platform Hitachi Content Platform is a hardware product that provides a robust and highly scalable solution for Microsoft Exchange Server archiving requirements, either as a direct target for Microsoft Exchange Server journaling or in concert with Hitachi Data Protection Suite. As a virtualized distributed object store, HCP offers advanced storage and data management capabilities that can help you address challenges posed by the ever-growing volume of unstructured data. HCP can be divided into a number of virtual content platforms, each of which can be uniquely configured for a particular workload. This allows your administrators to manage a single infrastructure that supports a wide range of data types, applications, and users with the specific level of service each needs, eliminating storage silos. Hitachi Content Platform is ideal for preserving data over long periods of time. Whether for legal, compliance, business or IT practices, Hitachi Content Platform technologies including data integrity checking, RAID-6, replication, encryption, WORM, audit logging and more ensure that data remains accessible and in its original form for years.